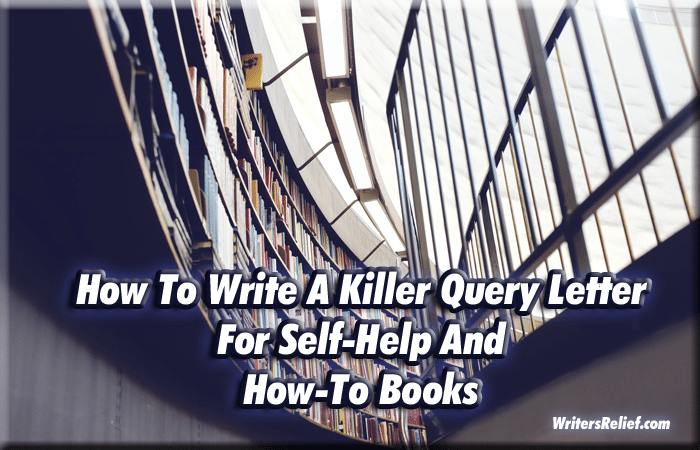 How To Write A Killer Query Letter For Self-Help And How-To Books - Writer's Relief, Inc. Writing a query letter for your self-help or how-to book? Follow this step-by-step template to craft a great blurb or summary and the ultimate persuasive pitch! 1. Introduce the primary problem. Start by explaining the main problem that your book addresses. By building a strong case proving there’s an existing, underserved audience for your book who can’t wait to buy it, you’ll have a better chance of capturing an agent’s interest. Note: We’re making up our own statistics below just to prove a point. Example: Every year, 500,000 Americans buy one million dollar’s worth of books about diets that they probably don’t follow. With conflicting reports about what’s good to eat and what’s not, readers are looking for a simple diet plan that offers fast, easy results. 2. Show how your book proposes the best, most ingenious solution to the problem. Don’t make vague statements. Your specific problem requires a specific solution. Example: My book, THE LIMA BEAN DIET, is the first book to take this simple vegetable and use it in an easy-to-follow diet plan that gets results with no hunger and NO complicated calorie or carb counting. 3. Present your talking points and headlines. What specific elements of your book could capture media attention? The more practical and applicable your advice, and the more surprising your solution, the more likely your book will stand out. *Note: As far as we know, this is totally untrue. But you get the point. Your angle has to be new and surprising. Take our advice about query letters, not diets! 4. Explain how your book is different from every other book available on your topic. If you’re writing in a competitive field (like diet or spirituality), then you should mention why your book is unique within the market place. Focus on what’s lacking in existing books on your subject. Be specific! But remember: You can go into more detail in your formal proposal. Example: Books like THE POTATO DIET have made similar claims, but didn’t catch on because they lacked the simplicity and nutritional magic of my breakthrough lima bean diet plan. 5. Say why you’re the right person to write your book. In self-help and how-to, who you are as a writer can’t be separated from what you’re writing about. Why are you the most qualified writer for this unique book? Your author bio should demonstrate a willingness and ability to support your message with a strong author platform. 6. Include information about who your target readers are. Consider offering comparison titles or specific details about the audience that would be interested in your book. Example: Readers of THE POTATO DIET, and diet books in general, will be interested in this revolutionary,never-before-seen concept in dieting. Don’t point out the obvious. We’ve read many query letters where writers point out the popularity of things that are obviously popular. Unless you can offer some surprising, eye-catching information that directly ties into your book, don’t waste agents’ time telling them what they already know. Use surprising facts only to make the point about why your book is going to sell. Every year, thousands of people die in car crashes. Every year, X number of people die or are injured from car crashes related to texting. The health food industry is one of the biggest in the nation, so people will read my new book The Lima Bean Diet. Surveys from X University suggest consumers have an increased skepticism about the claims of low-carb diets; my new Lima Bean Diet speaks to former and current low-carbers, as well as all natural food lovers. People love cop shows on TV. Newspapers report lots of crime stories. Therefore, readers will want to hear about my solutions to the crime epidemic. As you know, interest in true crime stories continues to surge, and readers will be intrigued by my radical approach to ending crime, which is detailed through my true stories of criminal rehabilitation. By following this outline, you’ll have a query letter that covers all the importation selling points of your self-help or how-to book. And that’s the best way to get literary agents intrigued and asking to see more! QUESTION: What was the last self-help or how-to book you bought? Revolutionary article! Thank you so much – I am following your template for a novel I am writing.